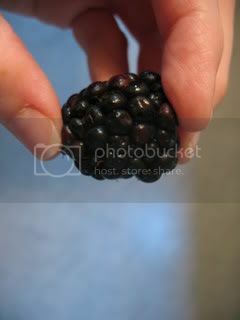 I bought a quart of gorgeous, huge blackberries at the farmers' market on Saturday. Even at $7.50, I couldn't resist them. But then came the decision of what to do with those gorgeous, huge blackberries. I considered cobbler (this week's Tuesdays with Dorie recipe), a white chocolate pie, & cheesecake. But, the weather the past few days has been too hot to bake. It's that infamous mid-western heat wave...a muggy, humid, sticky kind of hot that makes it hard to breathe outside. It seems even more stifling because we've had a fairly mild summer so far. It JUST got hot, and now it's too hot to cook, to clean, or to move off the couch...because my upstairs AC (the only central air in this big, old house) is running overtime and barely keeping up. Therefore, not only is it unbearably hot outside, but it's also pretty dang uncomfortable inside, too. So last night I used the gorgeous, huge blackberries to make a cooling sorbet...an easy recipe that only requires a few pulses on the food processor, a quick strain, and then some spoon lifts. 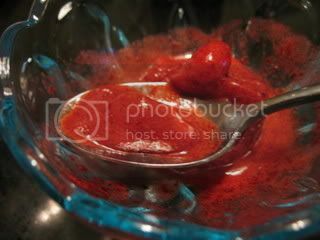 Puree the blackberries, water, & sugar in a food processor or blender. Press the mixture through a strainer to remove the seeds. Stir in the lemon juice. Looks delicious Kelly! 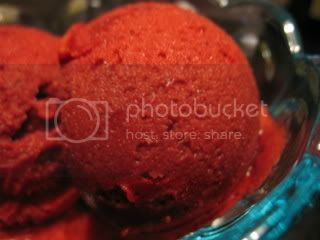 I've been pondering whether to get an ice cream maker and am still on the fence because I rarely do desserts. But this is very festive!